Sew what's cooking with Joan! : Stacked Fontina quesadilla's with a drizzle of white truffle! Quesadillas are the ultimate munchy, you can put almost anything in them, and they take only minutes to prepare; they can be low-cal or richly decadent; they’re filling enough to make a meal, but can be served at any time of day; they can be miniature or large size, designer-food or supermarket-specials, plain or fancy. And, no matter how you prepare them - they’re most likely to be delicious! For our 4th of July celebration I prepared Donna's stacked quesadilla, with a drizzle of white truffle oil, "it was inhaled", as one of our guests put it! Pre-heat oven to 400 F- Grate all the fontina cheese and set aside. 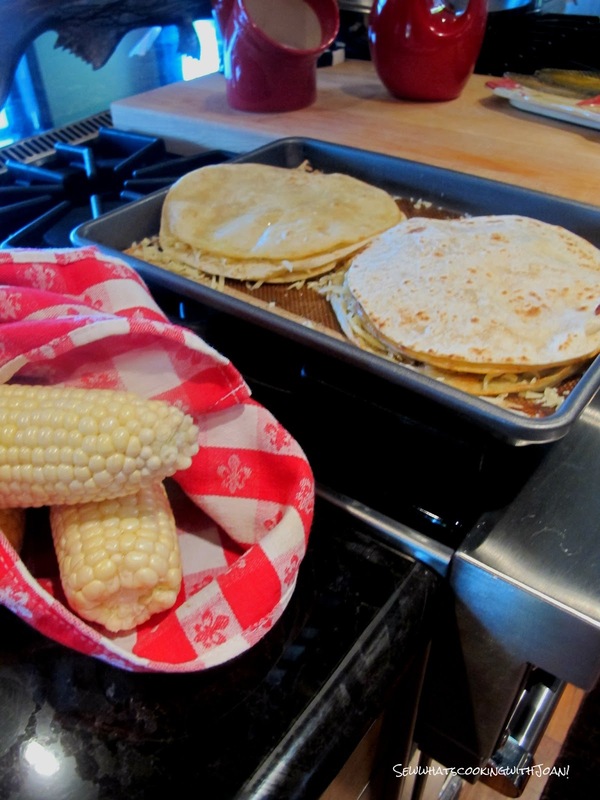 Spray pan with cooking spray and turn burner to medium, add tortilla. 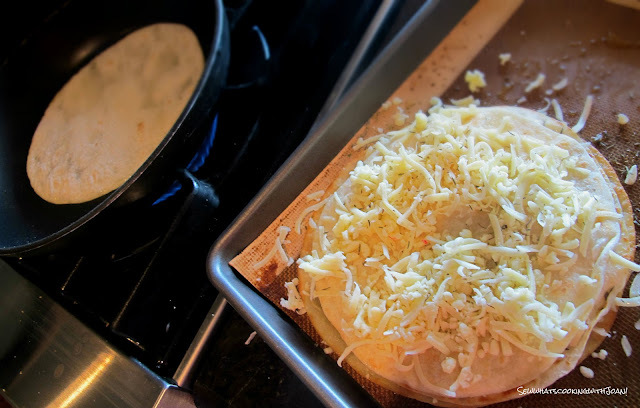 Quesadillas are made using flour tortillas. Cook 30 seconds, turn tortilla over, cook 30 seconds. Stack tortillas to side on paper towel. Layer the tortilla's putting the fontina cheese and sprinkling the thyme over on a rimmed baking sheet, lined with parchment or Silpat. I use three or four tortilla's in each stack. 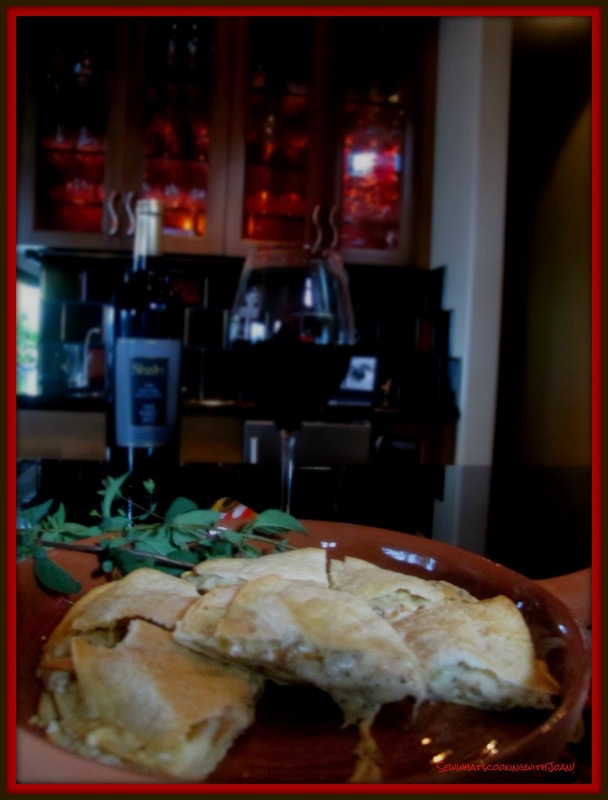 Bake for 8-10 minutes until light brown and cheese is flowing out.....yum! 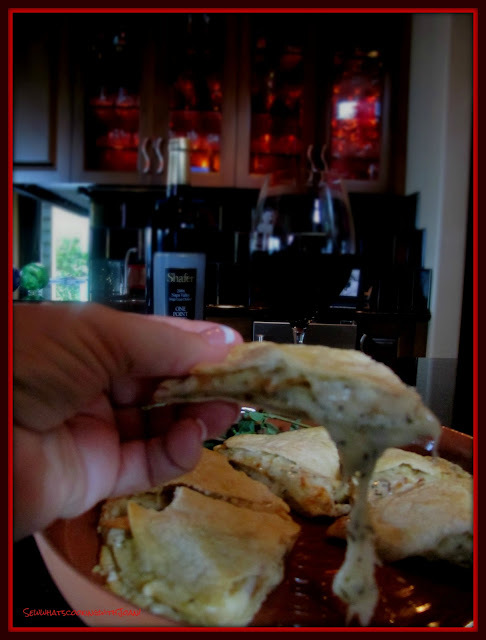 The hot quesadillas are cut into wedges (use a pizza cutter or large sharp knife), drizzle with white truffle oil and serve with your favorite beverage! I have an admission...........Donna's stacked quesadilla went so fast, that while I was getting my camera, all 16 wedges vanished!! Amy didn't even get a slice! No kidding.....no photo's!! So, this morning, I assembled, by myself (as to take no chances!) Donna's quesadilla and took the finale pictures. And now........well, I can eat the quesadilla all by myself!! Mmmmmm so creamy, so delicious! Our 4th of July was really a huge success, with lots of food, fireworks and fun! Can't go wrong with the three F's!! Yeah, everyone was wanting more, more, more!!! I will fix them at the Octoberfest this year!! I don't even know where to buy a cauliflower tortilla? Please share, that would be awesome!! I try to find healthy tortilla's for my wrap, when we go hiking. It is hard as some of the healthy ones are not flexible!